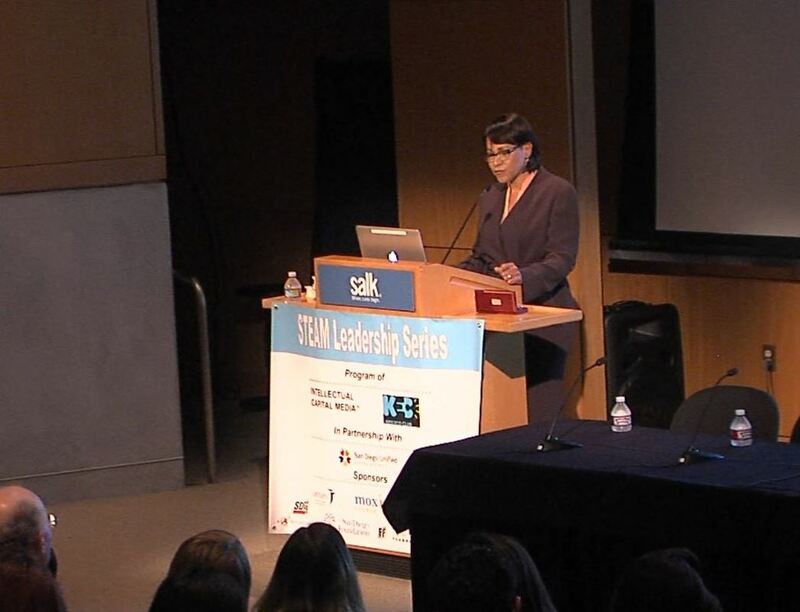 Busloads of students arrived at the Salk institute in La Jolla Thursday to attend the STEAM Leadership Series. 300 female high school students from 6 different schools in San Diego filled in The Conrad Prebys auditorium to learn all about STEAM (Science, Technology, Engineering, Arts and Math) careers. 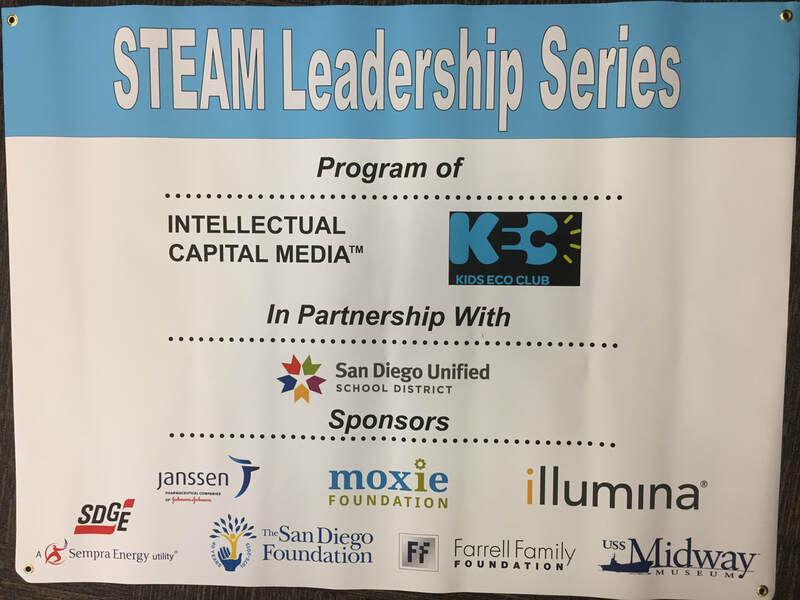 The STEAM Leadership Series focuses on career opportunities within STEAM fields and connects business leaders to San Diego students. USS MIDWAY MUSEUM JUNE 1, 2017, with Malin Burnham, Dr. Jyotika Virmani of the Shell Ocean Prize, Adm. Mac Macloughlin, Scripps Institution of Oceanography, Surfrider, Emily the Robotic Lifeguard, and much more. 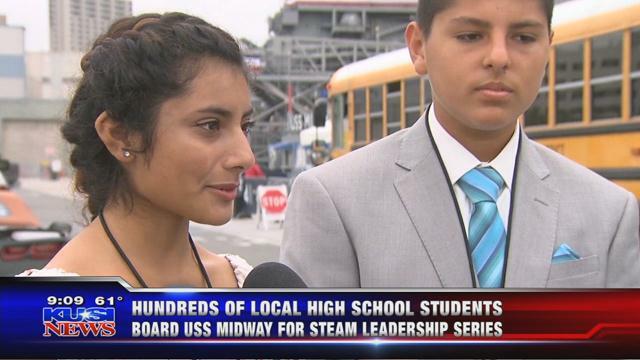 Link to UCTV San Diego Unified Steam Leadership Page. 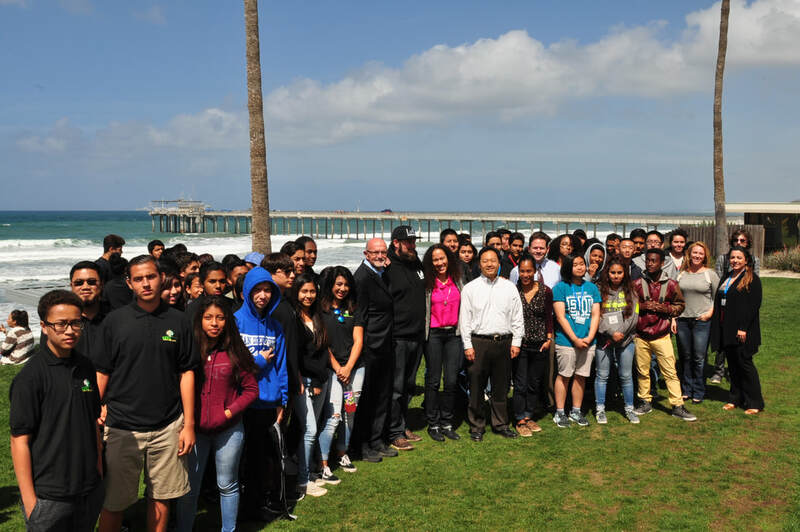 The successful San Diego STEAM Leadership Series bridges high-tech and science businesses with the high school system in San Diego in order to empower students from Title 1 schools and others to live their dreams and find great careers. We are entering our third successful year. 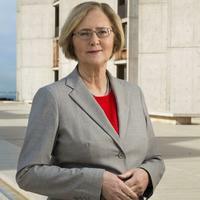 Previous events include the annual “Women at Salk” with Nobel laureate Dr. Elizabeth Blackburn (400 all young women,) “Drones on the Midway” with Northrup Grumman, General Atomics-Aeronautics, and Chris Anderson of 3D Robotics, Skies to the Streets,” also covering the Midway Museum; “Personalized Medicine” with Drs. Eric Topol and Stephen Kingsmore at the Illumina Theater/Alhambra, and many more. Social Impact Innovation from Immense Impact on Vimeo. MAY 20, 2016, ON THE USS MIDWAY MUSEUM, “From the Skies to the Streets"
​BLUE OCEANS - 5th in Our STEAM Series, a Project of Intellectual Capital and Kids Eco Club in partnership with San Diego Unified School System and Education Synergy Alliance, with Sponsors the San Diego Foundation, SDG&E, USS Midway Museum, Farrell Family Foundation, the Duane Roth Legacy Fund, and Ford Motor. Special thanks to Rubio’s Restaurants and producing vendor UCTV. For the past several years, the entrepreneurial lectures at La Jolla Country Day School showcased wonderful game-changing men and women who have changed our world, or made it better. They’ve founded companies that popularized the personal computer like Ted Waitt of Gateway (remember the famous black-and-white cow packaging? ); or the original biotech such as Hybritech, founded by Dr. Ivor Royston; or Irwin Jacobs, co-founder of Qualcomm, which makes up the guts, that is what’s under the hood so to speak, of the world’s 7 billion (and counting!) cell phones; or Jeanne Loring, head of stem cells at The Scripps Research Institute; her counterpart at Sanford Burnham, Larry Goldstein; real estate impresario Ernest Rady, philanthropist Darlene Shiley—and more. Darwin the poodle bursts into Craig Venter’s capacious new office on Torrey Pines Road just as he is explaining the meaning of life. It’s digital, life. We are information systems. The chemical elements of our DNA “software” can be broken down into the four nucleotides or bases that make up DNA, “the A’s, C’s, G’s and T’s ﻿of the biological world,” and converted into the 1s and 0s of the computer world, says Venter, 67. After only five years as an internist at Scripps Clinic, Dr. David Clayton could tell what was wrong with many of his patients before they even took off their shirts. They were men, 50 to 80 years old, overweight, with high blood pressure and bad cholesterol — the perfect trifecta for the chronic metabolic disease currently bloating America. If they did nothing, they might be dead before their time, candidates for diabetes and stroke. Some 90 percent of people over 60 take at least one medication, and more than one-third of those over 60 are on five or more medications. And even many men and women who do get exercise and try to eat healthy fail because in this hyper-hyped world of “natural this and natural that,” they don’t understand the biochemical truth underlying their choices. Kim Kamdar of Domain Associates says the company is excited about biotech and medical device companies in the effort to tailor medicine to specific patients. 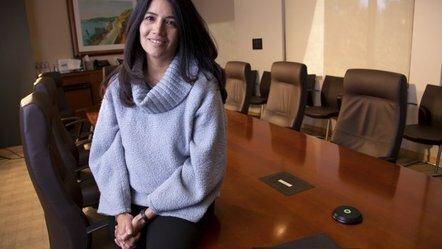 NELVIN C. CEPEDA • U-TDomain — which helped start Amgen, Applied Biosystems and Amylin, among others — is 21 percent invested in San Diego and is betting big on diagnostics companies. 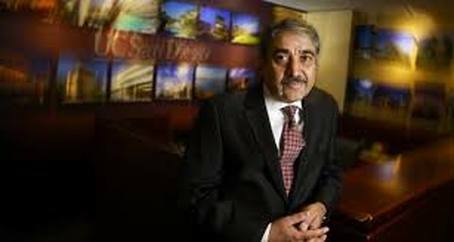 U-T San Diego recently talked with Kamdar, based in the San Diego office, about Domain’s investment strategy. Tech transfer is about dancing robots and curing brain cancer. Google and Gatorade, sleep apnea and gene-splicing. It’s how inventions and ideas — intellectual property — move out of university labs and get translated into commercial products and startup companies. Some $2.5 billion in licensing fees flowed to U.S. universities in 2010, with nearly 600 new companies formed. Andrew Viterbi, co-founder and former longtime chief technology officer of Qualcomm, the giant San Diego company that creates the guts of the world’s cellphones, devised the Viterbi Algorithm, a mathematical formula for separating signal from noise. The Viterbi Algorithm has made cellphone communication possible, as well as the tracking of missiles, and even high-speed DNA analysis. Agus, head of the University of Southern California’s Westside Cancer Center, an expert in molecular medicine and a CBS News contributor, has become an apostle of prevention. He once stood up in an auditorium of oncologists and declared that metastatic cancer was better approached with preventive measures — before cancer was diagnosed — since cure rates after-the-fact are only marginally better than they were 50 years ago. 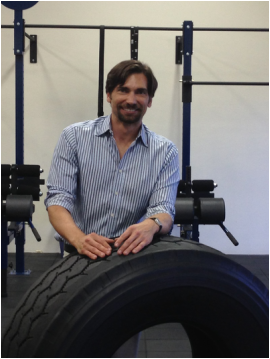 Greg Lucier has made the 21st century — the biological century — into a wise business proposition. 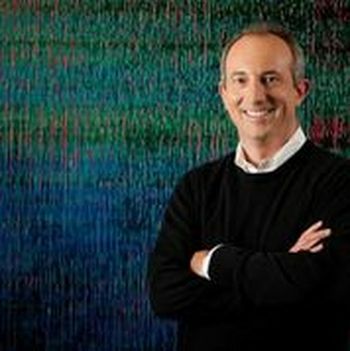 In a deal completed Monday, Chief Executive Lucier and his team merged Carlsbad’s Life Technologies with Thermo Fisher, based in Waltham, Mass. Thermo paid $13.6 billion for Life, closer to $16 billion if you count assumed debt, in a deal that highly valued the company’s Ion Torrent genetic sequencing platform as well as Life’s bread-and-butter consumable lab products. The terms also provided Lucier with a $38 million personal exit. How did he do it — drive up the business of Life from $778 million a year in revenue in 2003 to $3.8 billion in 2012 — and what does he plan to do next? Larry King has been the king of the talk business — radio, television, and now the Internet — for longer than most Americans have been alive, 56 years. He has a new deal with Carlos Slim, richest man in the world, to produce and distribute “Larry King Now” on Hulu and Ora.tv. His 80th birthday was Tuesday. And, oh, yeah, baby, he’s married to his seventh wife. 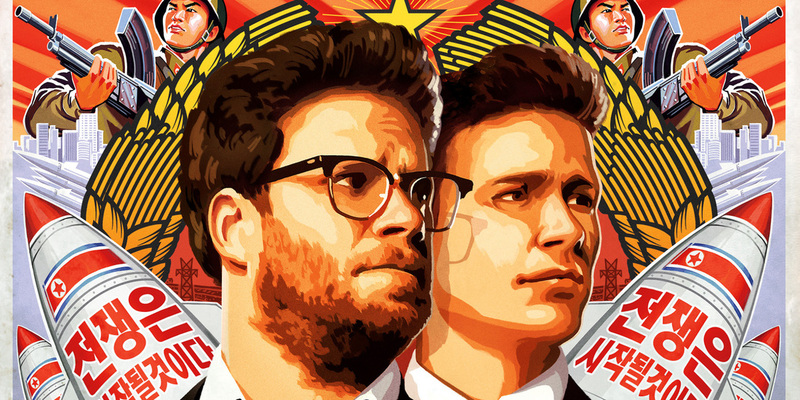 “Innovation Night” at the La Jolla Playhouse was both a sad and a raucous affair this year. Sad, because it was dedicated to Duane Roth, the late director of Connect, an organization that brings inventors and investors together. Roth, who died after a bicycle accident in July, had coined the term Innovation Night as a way to link San Diego’s innovative wireless, biotech and high-tech industries to the innovative theater productions the Playhouse is known for. But raucous, too, because the gala opening play was “Side Show,” which is about two female circus performers, conjoined twins, not unlike innovative technologies and the future of San Diego, someone laughed at intermission. Fernando Aguerre, 55, the co-founder with his brother Santiago of the iconic surf brand Reef, has reached the statesman stage of life. The Surf Industry Manufacturers Association named him Waterman of the Year, one of only two times in 24 years that a business guy, as opposed to surf legends Greg Noll, Kelly Slater and Rob Machado, has been picked. KYOTO, Japan — Kyocera is a company you don’t see. What happens when San Diego outgrows its new $1 billion expansion of Lindbergh Field? Some 17 million passengers used Lindbergh in 2012. Noise, safety and environmental concerns become ever more vexing as the airport is surrounded by the high-rise city that San Diego is becoming. Land is expensive. The Marines appear to have no interest in sharing space at Miramar for a new civilian airfield. 3D Robotics, started by kid genius Mexican engineer Jordi Muñoz, now 27, and Wired magazine visionary Chris Anderson, 52, just received $30 million in additional investor funding. The company is expanding to 100 employees spread among current engineering headquarters on Convoy Court in San Diego, manufacturing facilities in Tijuana, and sales and marketing in Berkeley, with capacity expected to double. There has been much debate about whether test prep can increase scores and by how much — a cost-ineffective 30 points or a healthy 100, enough to raise an admissions officer’s eyebrows and cause hand-clapping among parents who pay for all this. Emily Sugihara, 30, has made the lowly shopping bag fashionable. With her mother, Joan, she is the creator of the Baggu, the colorful, “carry in style” reusable bag sold in hip stores from Urban Outfitters to Collette in Paris, as well as Nordstrom and J.Crew. Hundreds of thousands more, at a basic price of $9, are sold through the bright and spare Baggu website, which looks like a Google home page for the fashion-conscious. Jack White pretty much developed the concept of the discount brokerage, the way stocks have come to be traded on the Internet for a small fee. This was in the 1970s and ’80s, years before E-Trade, Ameritrade or Charles Schwab. He sold his company to the Toronto Dominion Bank for $110 million in 1998, back when $110 million bought more than a good breakfast at Brick and Bell, and the company formed the basis for TD Waterhouse, which became TD Ameritrade. "George Phydias Mitchell, “The Father of Fracking,” a technique for extracting natural gas and oil that is making the United States energy-independent, died last month at the age of 94. The Texas oilman transformed global energy markets by figuring out how to drill into and along layers of gas-laden shale rock, then force a slurry of water, sand and chemicals under high pressure into the rock to crack it open and release the hydrocarbons. Engineers later learned how to adapt this process, known as fracking, to oil-bearing rock. His son, research scientist B. Greg Mitchell, head of the Photobiology Group at the Scripps Institution of Oceanography in La Jolla, sat down with Intellectual Capital to reminisce about how his father did it."